This page discusses (at some length!) how the concept of "optimum phasing" works out for overhead lines where the conductor bundles (or phases) are arranged in a triangle rather than a straight line. See our main page on phasing including details of the UK policy to adopt optimum phasing. This is prompted by the introduction by National Grid of the T-pylon, an example of exactly this triangular arrangement, but the principles hold true for any other triangular arrangement. First, a recap on how optimum phasing works for traditional lattice pylons, where the phases for each circuit are roughly in a straight line, or a "linear array". Note: to illustrate the principles as clearly as possible, we've simplified a bit - we've considered circuits that are exactly vertical rather than sloping slightly because of the taper of the pylon, and we're considering the field level with centre of the conductors rather than at ground level. Both of those factors introduce some elliptical polarisation rather than the linear polarisation we show here. You can see this in more detail on a separate page. This produces a lower overall field to the sides of the line, so we call it "optimum" phasing. Linear arrays (as above) produce linear fields. The key difference is that triangular arrays produce fields that rotate instead of just oscillating backwards and forwards in a straight line - "elliptical polarisation". For any triangle, the field goes round an ellipse. For the phases in an equilateral triangle, which is what we will consider here for simplicity, the field goes round an exact circle. Note: the purpose of this graph is to show how changing the phasing changes the field. So the absolute values of field aren't so important. But in fact, this graph is calculated for the same conditions we use to illustrate all the other factors affecting the field from power lines - 12 m ground clearance and 500 A per circuit, fairly typical of normal conditions for UK power lines. We will return to this graph later and make sense of all the various different curves. The horizontal components of the field are behaving exactly as they did for the linear array - they are opposing each other and partly cancel each other (you are closer to one circuit than the other, so the field from that circuit is stronger, so the cancellation isn't perfect). But the vertical components are reinforcing each other. This means transposed phasing is not actually the optimum phasing for triangular arrays. Unfortunately, you can't achieve this with a T-pylon or similar - you'd need conductors on one circuit positioned half way between where they actually are - the triangle pointing up instead of down. Note that we are concerned with reducing the field to the sides of the line, where people are most likely to live or to spend time. Close to the line, and in particular between the two circuits, the relative merits can actually reverse - this often happens with phasing and we explain why on a separate page. The next two drop-down boxes now go on to explain what happens to the phasing when you need to transition between different types of pylon. Unfortunately, this means that you cannot have optimum phasing for the lattice and the T-pylon simultaneously - you have to prioritise one or the other. The second reason is that, as explained higher up this page, phasing is more effective for the lattice pylon than for the T-pylon. Whatever phasing you chose for the T-pylon, it wouldn't produce as big a reduction to the sides of the line as transposed phasing does for the lattice pylon. Between the circuits, the situation is different, as we've said before. But to the sides of the lines, which is where we're mainly concerned with, the phasing we end up with is actually not too bad. It's the second lowest of the six options, and the further out you go, the closer it gets to the ultimate optimum. The one on the left is the one that is the optimum for the T-pylon on its own. But the one on the right just so happens to be the phasing you get when you optimise the lattice pylons. To complete this story and explain why these two aren't exactly the same, we now need to unpick the assumptions we've been making just a little bit more. All this modelling of fields as rotating in circles is true when you are quite a bit further away from the conductors than the distance between them, so that you can treat the array of three phases as a single source and not have to worry about the contribution of the individual phases. Obviously, the further away you get, the more true this becomes. This is why the field for the combined optimum phasing converges on the field for the T-pylon-alone optimum phasing, and if we extended the calculation to even larger distances, they would become exactly the same, because they are both producing fields that are 120 degrees apart. And this means that the "rotating vectors" diagram - which shows what happens at large distances - is actually the same for these two options. But when you are closer to the line itself, you cannot just rely on the circular-rotation approximation, you have to start taking account of the individual phases. And, as can be seen from the diagram above, the relationship of the individual phases looks quite different when you're close to them. That is why the T-pylon-alone optimum phasing produces lower fields than the combined optimisation. But the combined optimisation is still better than any of the other options. And, underlying all this, the T-pylon produces a lower field to start with. 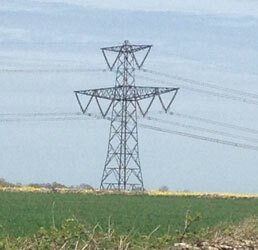 All fields from all power lines comply with the relevant exposure limits in the UK. The discussion above was about what happens to the phasing when you transition from the traditional lattice pylon, with vertical circuits, to the T-pylon, with triangular arrays. 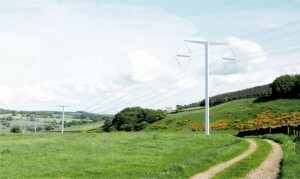 But there's another design of pylon with triangular arrays - the low-height pylon. There's one more sublety. There are two different ways of having the magnetic fields 120 degrees apart. They both deliver the same benefit of reduced fields at large distances, but they differ at closer distances. For the T-pylon, the one we end up with when we start with a transposed lattice was the less good one at closer distances - overall, the second best out of the six phasing options rather than the best. But for the transition to the low-height pylon, the option we end up with turns out to be the best. In other words, when transitioning from a traditional lattice to a low-height lattice pylon, both can have optimum phasing. This page explains how linear arrays of conductors produce mainly linearly polarised fields and triangular arrays produce mainly elliptically polarised fields. But even linear arrays on traditional pylons end up producing fields that are to some extent elliptically polarised. This page is mainly about how the phasing changes the field. 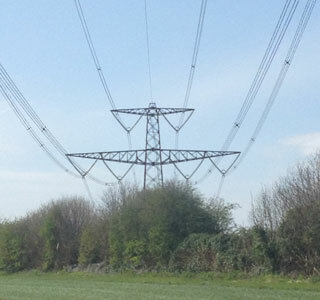 See more on the actual field values from traditional 400 kV lattice pylons and from alternatives including the T-pylon. You can use our online calculator to experiment with varying the phasing of both T-pylons and traditional lattice pylons and see what effect it has on the magnetic field.